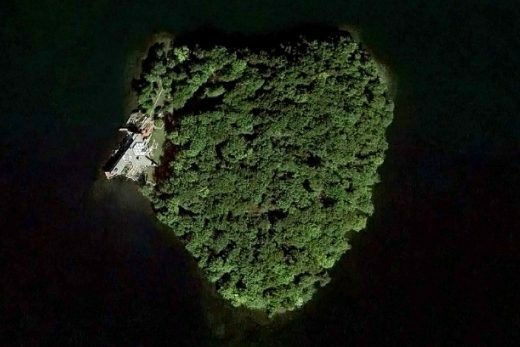 In 2019 this has now been reduced to $12.9 million. 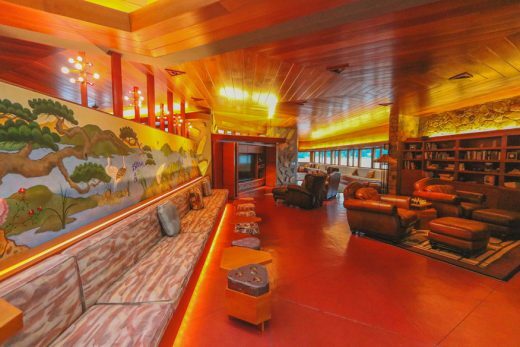 Due to a running dispute with the Frank Lloyd Wright Foundation and subsequent out-of-court settlement the home can only be described as being “inspired by Wright” rather than a faithfully rendered, certified Wright design. 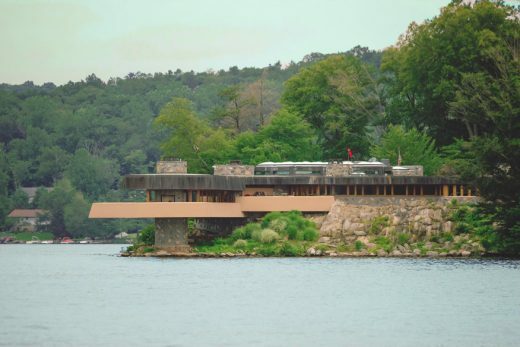 In 1949 an engineer called Ahmed Chahroudi purchased the island and commissioned Frank Lloyd Wright (FLW) to design a single-family residence for him and his family. 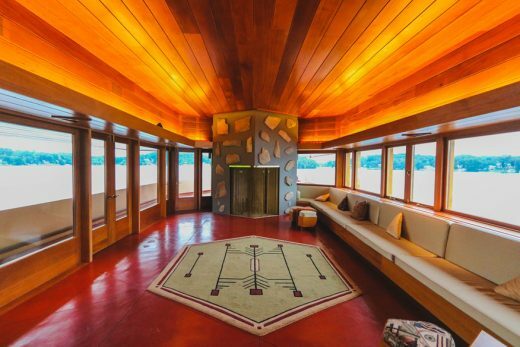 FLW initially sketched a 5,000-sqft residence, and estimated that it would cost $50,000. Chahroudi, who could not afford the price tag, negotiated a smaller 1,200-sqft house instead. Wright then designed and built a three-bedroom, one-bath cottage between 1951 and 1953—known as the Chahroudi Cottage. Although Wright never built his initial design for the island’s main residence a similar house did come into existence 48 years after the architect’s death. 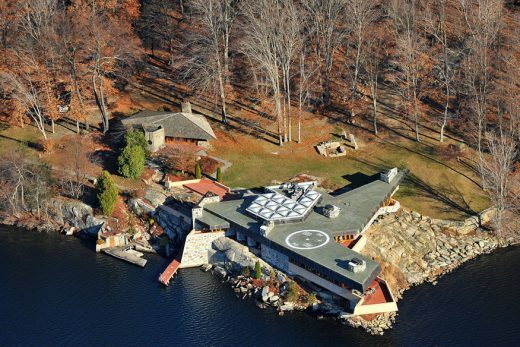 In 1996, sheet metal contractor Joseph Massaro and his wife Barbara purchased the island, which came with the Chahroudi Cottage as well as the five original drawings by Frank Lloyd Wright of the unbuilt larger residence, including a floor plan, a section, and three elevations. 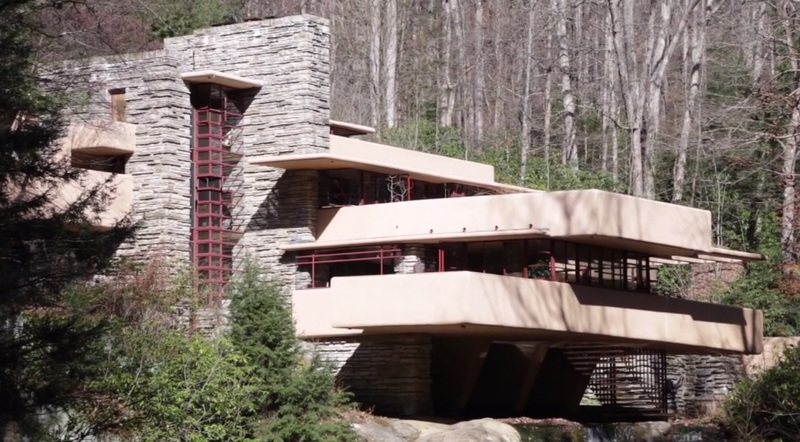 Massaro decided to build the main residence from FLW’s drawings. 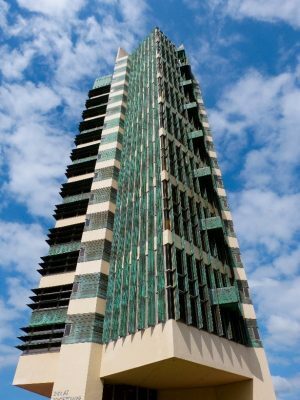 Since Massaro could not afford construction supervision charges proposed by the Frank Lloyd Wright Foundation, he commissioned architect and Frank Lloyd Wright historian Thomas Heinz to oversee the construction. After four years, the Massaro House was completed in 2007. It has four bedrooms and two-and-a-half bathrooms. 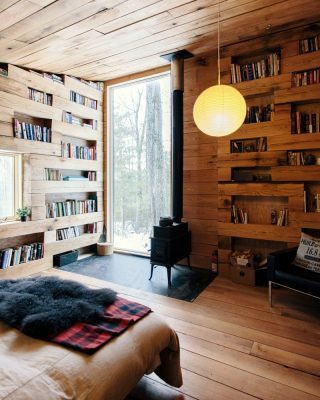 The Massaro House has received criticism over details and aesthetic characteristics of the residence. 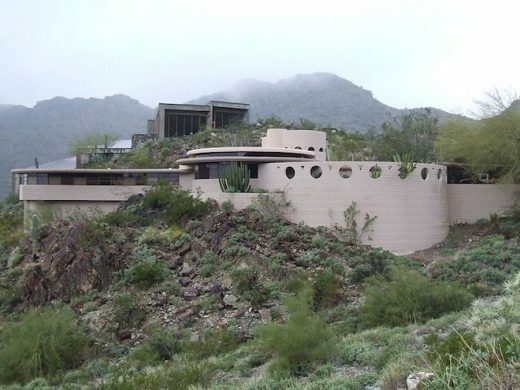 FLW was known for an evolution of the design during construction and obviously that couldn’t happen with this property. 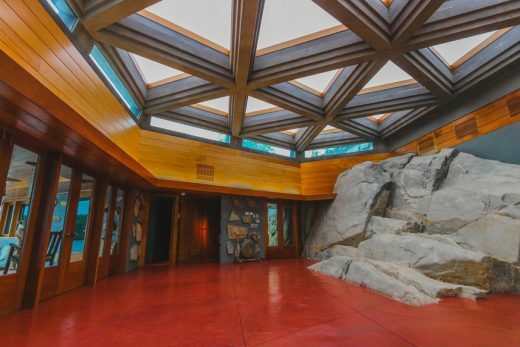 The design of the main residence was site-specific, incorporating a rock formation (like he did at Fallingwater, PA) into the main entrance foyer, kitchen, and one of the bathrooms. 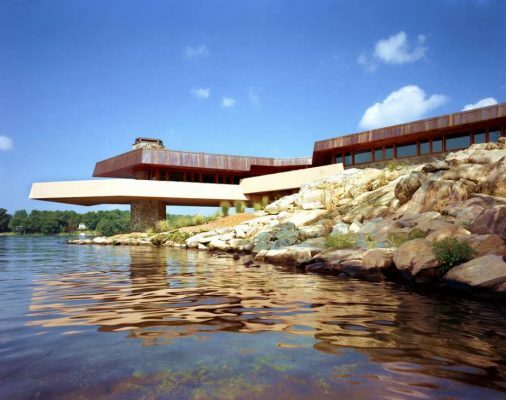 The house features a cantilevered deck over Lake Mahopac, and a rooftop helipad. Twenty-six triangular skylight windows create a light-filled interior. The house is furnished mostly with Wright-designed furniture, including built-in pieces. 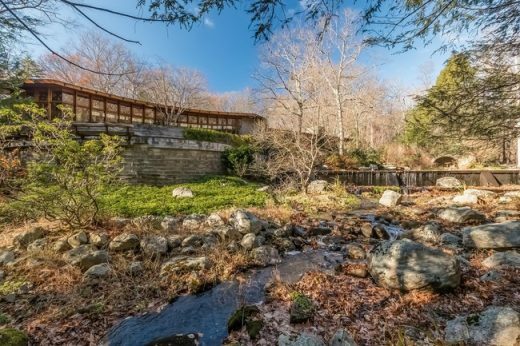 For the first time in 20 years, Frank Lloyd Wright‘s Rayward–Shepherd House, also known as Tirranna home, in New Canaan, Connecticut is on the market.